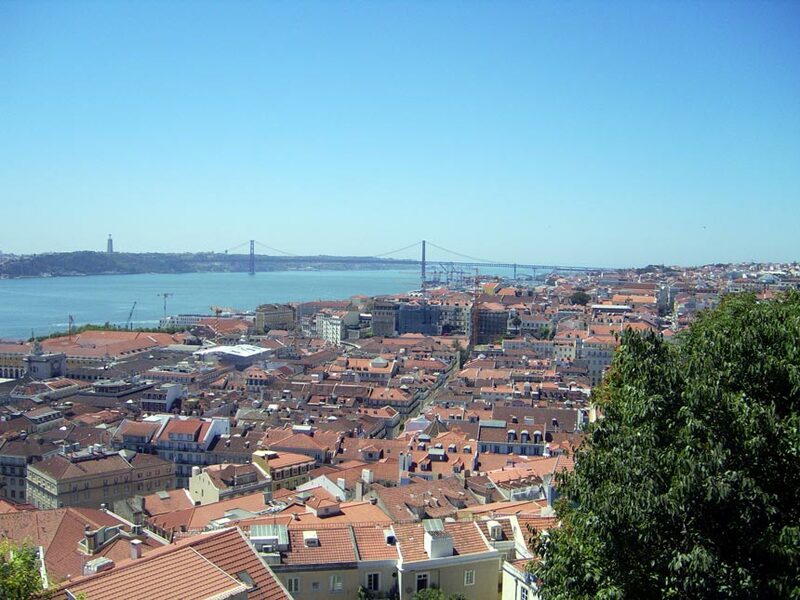 When I think of Lisbon, the first images that come to my mind are the breath-taking vistas from the many miradouros (lookouts) spread over the hills of the city. Every miradouro has its own atmosphere and offers a unique view. Like a model, Lisbon poses in different positions for you, the photographer, flaunting all her beauty. 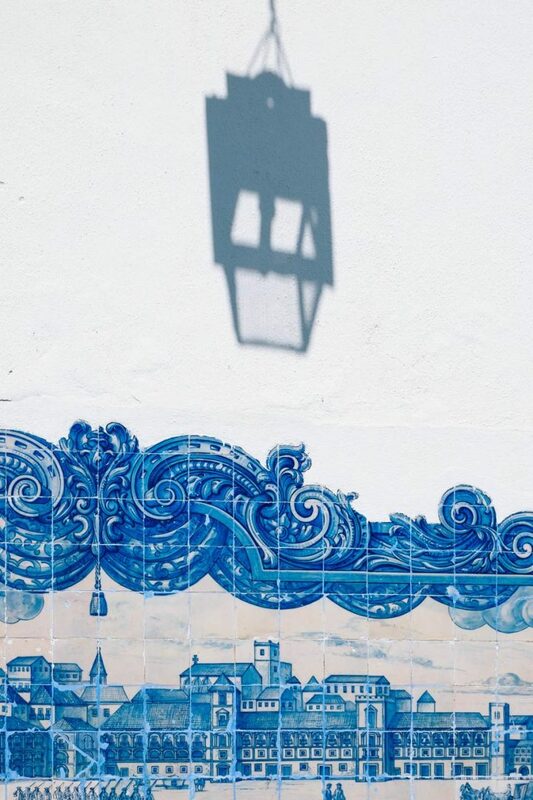 The miradouro de Santa Luzia, in the heart of the Alfama district, part of the old town, is possibly the most romantic, with its green terrace and little church adorned with fine azulejos (blue and white tiles). Here, in contrast with the tourist groups coming and going and the couples seeking some intimacy, Lorenzo and I spent a lot of time drinking bottles of Super Bock (a local beer) and contemplating the graceful mantle of red sloping roofs among which the domes and belfries of dozens of churches stand out. The stunning picture is completed by a blue cloudless sky and the huge delta of the Tagus River crossed by the imposing 25 de Abril Bridge. Enjoying the fantastic view and a cold local brew. 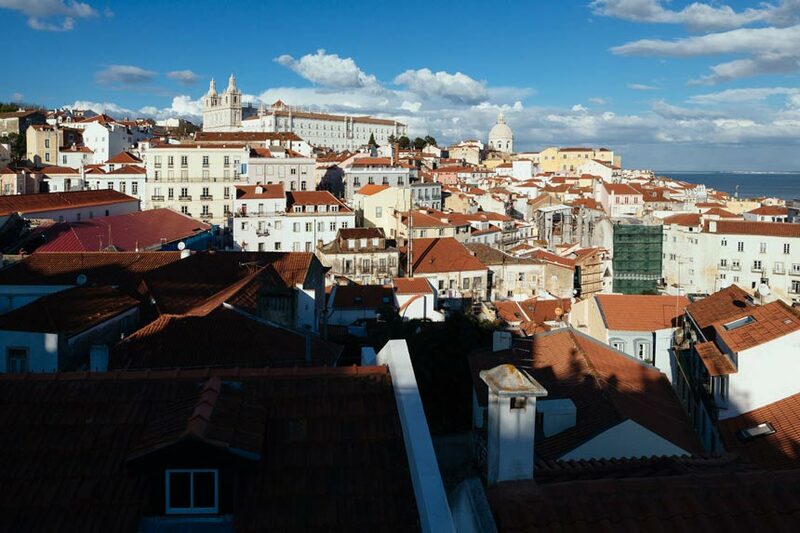 Right below us is the maze of alleys of Alfama; further down, at the foot of the hill, the tangled urban texture unravels in a grid of large boulevards and squares such as Praça dos Restauradores and the splendid Praça do Comercio. This is the Baixa Pombalina, a quarter which was entirely rebuilt according to the principles of architectural rationality after the earthquake of 1755. 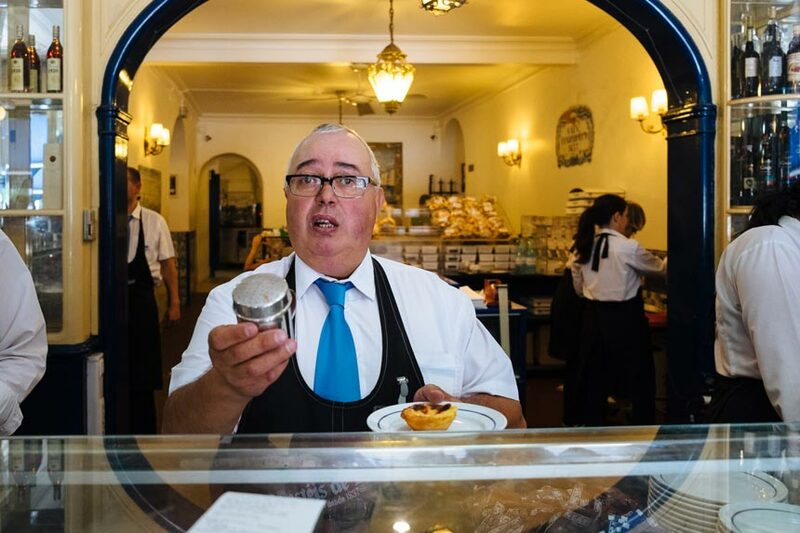 Grand public buildings and squares, tree lined avenues, refined shops and restaurants make Baixa the lounge of Lisbon. Some of Lisbon’s transit systems are real gems, particularly the elevadores. Given their venerable age (made at the turn of the nineteenth and twentieth centuries), one would expect them to be displayed in a museum; instead, they still carry around thousands of tourists and locals alike. The most interesting for us was the Elevador de Santa Justa: not a funicular like the others, but a gigantic lift of wrought iron. Talking about transit systems, a journey on the legendary Tram 28 is an experience not to be missed. We took it at least ten times, enjoying ourselves like children (we had a multi-day pass). 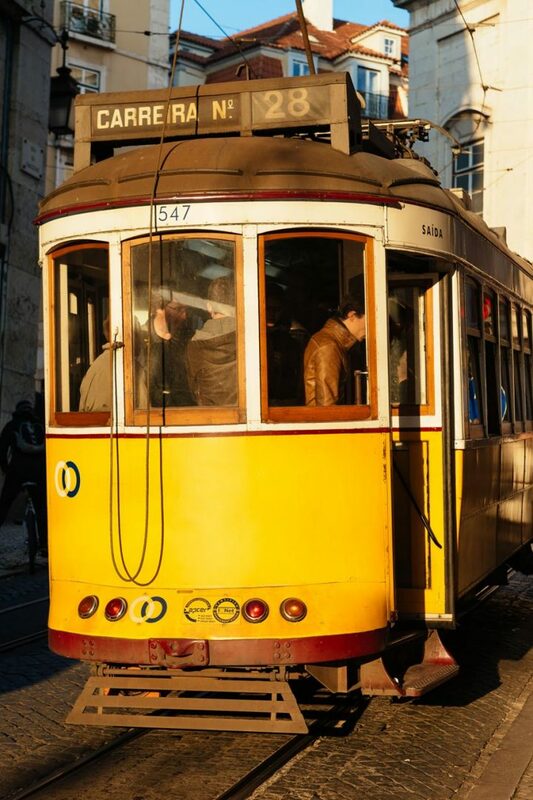 This vintage tram passes through some of the most beautiful districts of the citysuch as Baixa, Graça, Alfama and Estrela, facing steep slopes in very narrow alleys. 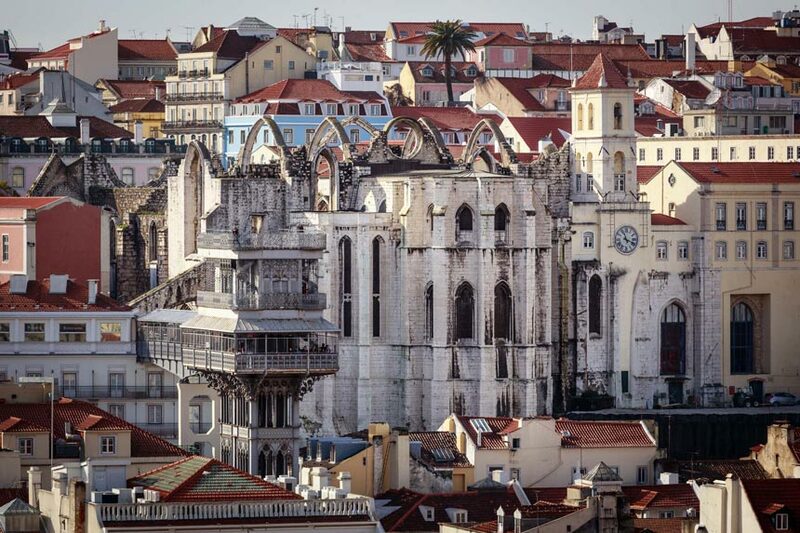 While riding this special rollercoaster, we caught glimpses of some of Lisbon’s monuments: the fortress-like façade of the Sé de Lisboa (the cathedral); the fine Basilica da Estrela, the Church of São Vicente de Fora and the National Pantheon, where eminent Portuguese men and women are buried, including the Queen of Fado, Amália Rodrigues. Be warned though: enjoy Tram 28 responsibly! If you lean out of the window you run the risk of losing your head, literally. Tram 28 stops by the Castelo de São Jorge that dominates the city’s skyline from the top of a hill. The castle was built by the Moors and then taken by the Christians led by Dom Afonso Henriques, the man who would become the first king of Portugal. We learn as well some of Lisbon’s millennia-old history, indeed one of the oldest in Europe, its foundation predating even that of Rome. “Well, she doesn’t look her age”, I comment while admiring the umpteenth superb panorama from the ramparts. 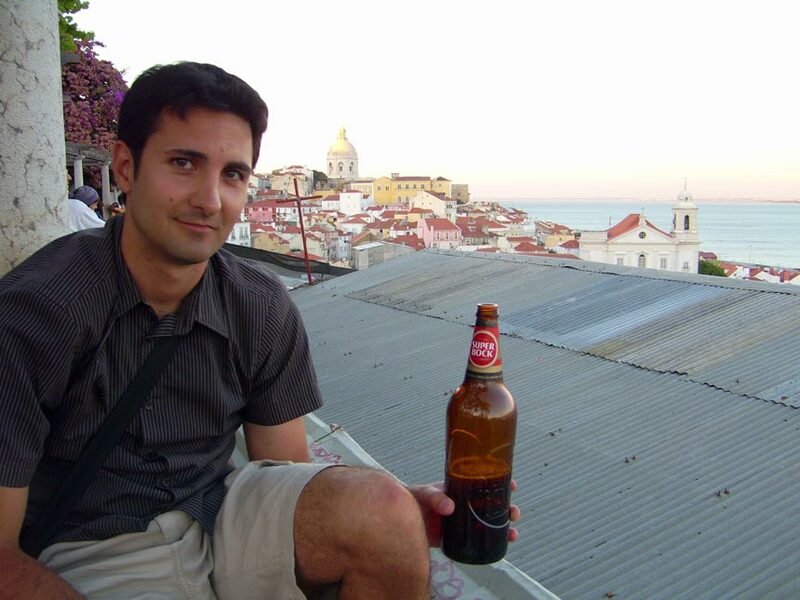 Once we leave the castle, Lorenzo comes up with the idea of watching the sunset from the highest point of the city, whose name alone is a poem: Miradouro da Nossa Senhora do Monte (Lookout of Our Lady of the Mountain). How do we get there? By Tram 28 of course! The little church and the surrounding pine trees create an aura of tranquility. This time groups of young people are having a beer like us. At dusk a soft light casts upon the white and pastel-coloured buildings and the castle. For dinner we stumble upon a cozy, family-run restaurant serving specialties from the north of Portugal. After having feasted on bacalhau e sardinhas duringthe last few days, we wanted to eat something new. “We’ve come to try the francesinha”, we declare to the waiter faking a provocative demeanor. Behind this innocent name (“the little French girl”), in fact, hides a dish very appealing to two gluttons like us: bread, ham, linguiça, roast beef, melted cheese and eggs covered by a tomato-beer sauce and served with fried potatoes. No portuense (inhabitant of Porto, the hometown of francesinha) would ever admit that you can have a decent francesinha in Lisbon, yet both Lorenzo and I liked it. Before our final judgement, however, we’ll have to try the “original one” in Porto. To enjoy Lisbon’s nightlife, the place you want to be is undoubtedly Bairro Alto. An endless series of bars and clubs brimming with people, the streets of Bairro Alto seems to be filled with the entire young population of Lisbon . 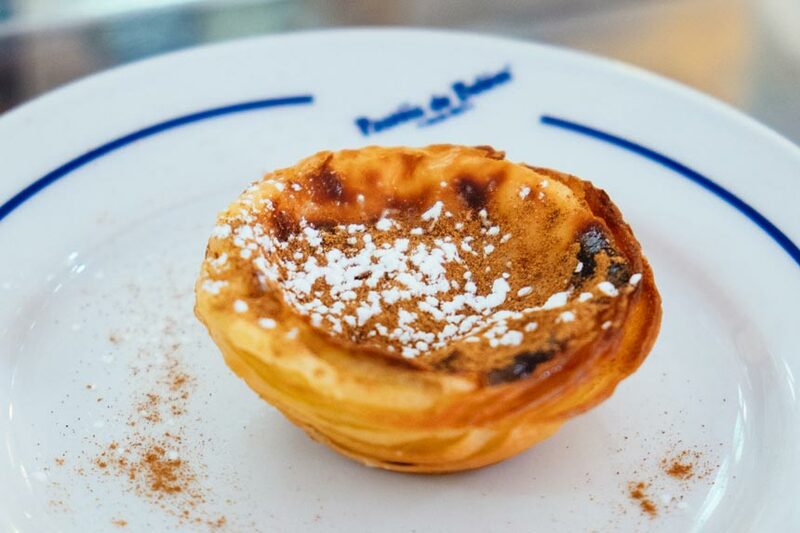 After a wild night of cocktails, the next morning our minds are still a bit foggy, and the best way to clear them up is with a bica (a term people from Lisbon use referring to espresso) and some mouthwatering pastéis de nata (custard tarts). Next we are ready to explore Belém, a neighborhood on the bank of the Tagus. 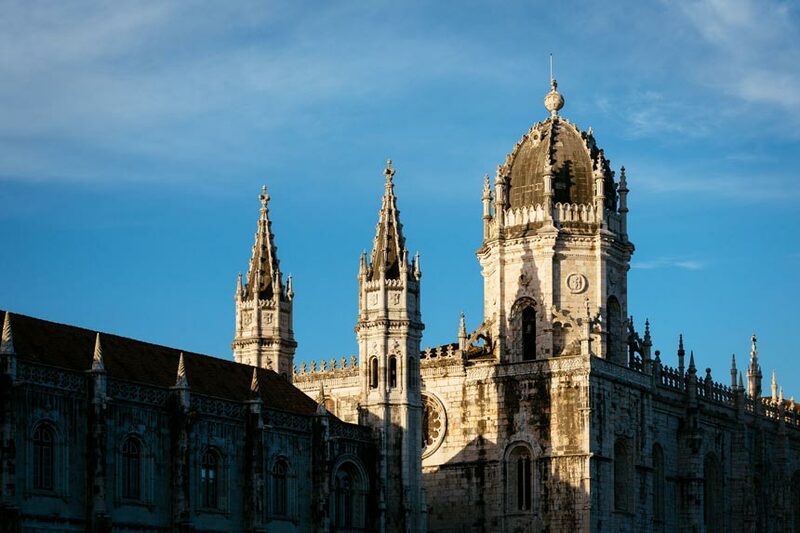 Here you’ll find the Mosteiro dos Jerónimos and the Tower of Belém, both classified as UNESCO World Heritage Sites. The monastery is impressive even from far thanks to its colossal scale. However, from a close range it becomes truly awe-inspiring, once one discerns the abundance and quality of its carvings. 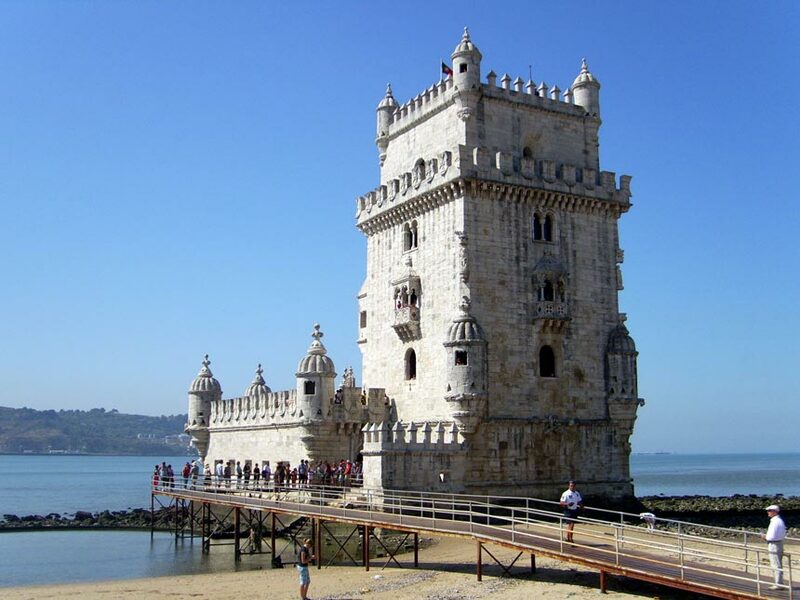 The Tower of Belém shines like a pearl laid down on the shore of the river. The contrast between the candor of its walls and the blue background of the water is so charming that it seems to be drawn from a fairy tale. Mosteiro dos Jeronimos and Tower of Belem. These two iconic monuments were built in the 15th and the 16th centuries, a period in which Portugal turned from a small kingdom, confined in a corner of Europe, into a vast colonial empire. The nearby Padrão dos Descobrimentos (Monument to the Discoveries) celebrates the glory of the Portuguese explorers, who, defying the unknown and perilous oceans, opened trade routes that would change history. The last evening, roaming the meanders of Alfama, we felt more intensely than ever that feeling of nostalgia that imbues the soul of Portugal: the saudade. We read it in the languid eyes of the elderly people who sip small glasses of ginjinha (a sour cherry liquor) in the tiny tascas, places where time has ceased to be. They drink quietly and exchange a few mumbled words and whispers. We hear it in the mellow notes of fado, the moving and poetic music that accompanies Portuguese nights. The lyrics sound to our ears like an endless sad poem. It’s a melody captivating and inescapable like fate, the word from which this musical genre takes its name. Fado is the chant of nostalgia for people and places long gone, for the time that flows and never comes back. So, as the guitars and the piercing voice of the singer raised the bittersweet melody towards the starry sky, I had a little foretaste of the saudade I’m feeling now, writing of that trip to Lisbon of many years ago. Have you ever felt saudade for a place you have visited or perhaps for your homeland while you were abroad? Have you ever been to Lisbon or Portugal? Did you feel the same melancholy spirit that I felt? Let me know in the comments below.